Rothschild residents seeking a second review of the wood-burning power plant in Rothschild filed a lawsuit Tuesday against the state Department of Natural Resources. Opponents of the project hope to force the DNR to re-evaluate emissions expected to come from the facility. Save Our Air Resources filed the suit in Marathon County Circuit Court one day after Domtar decided to go forward with the project and comply with state regulator's requirements. Buffalo County development project on hold; "The uncertainty is killing us." In the past six months, three wind farm developers with a combined investment of more than $600 million have stopped operations in Wisconsin — victims of regulatory uncertainty and what some now perceive as a hostile business environment for “green” energy. The wind farms — planned for Calumet, Brown and Green Lake counties — would have created more than 1,100 jobs and helped Wisconsin reach its goal of generating 10 percent of its energy through renewable sources by 2015. But new wind regulations, more than two years in the making, were shelved as the Public Service Commission works on a more restrictive set. Combined with a series of initiatives pushed through by Gov. Scott Walker and the Republican-led Legislature, industry officials and environmental advocates say Wisconsin seems more concerned with making green than being green. Currently the Public Service Commission is holding meetings with advocates and opponents, trying to iron out a compromise. Neither side wants to start from scratch, but PSC officials said they are at a standstill. Thousands of future jobs are at stake if Gov. Scott Walker doesn't veto a provision in the state budget that limits funding for the Focus on Energy program, local business leaders said Wednesday. "I see it being a real detriment to our business and our customers going forward if we don't have these funding increases," said Jeff Klonowski, regional manager of Kaukauna-based Energy Federation Inc., which supplies lighting fixtures, foam and weather-stripping materials to area contractors. But supporters of the provision object to the amount of the funding increase, not the program. "The Focus on Energy program certainly had a lot of benefits, but the huge increase in assessments that were put in place at the end of last year, we think, were too much, too soon," said Scott Manley, director of environmental and energy policy for Wisconsin Manufacturers and Commerce, the state's largest business lobby. Walker received a letter Wednesday signed by more than 120 businesses asking that he veto that provision in the state budget bill. His office responded with a one-line statement: "We'll evaluate that provision and make any veto-related announcements once the decisions have been finalized." The statewide Focus on Energy program is funded by tax assessments on utility bills and provides grants to help homeowners and businesses pay for energy-efficient upgrades. It also helps pay for consultants to advise property owners on which type of upgrades would be practical and cost-effective. Each year, utility companies contribute 1.2 percent of revenue — about $100 million total — to the program. The state Public Service Commission proposed in December raising the utility bill assessments from $94 million in 2010 to $256 million by 2014. The proposal calls for utilities to increase their contributions to $120 million this year. That amount is fixed even if Walker does not veto the provision. However, assessments would drop to around $100 million in 2012, instead of the initial proposed increase of $160 million for that year. Three companies have their sights set on excavating a high quality sand that lies about 20 feet below Marshfield's surface. The hard, round sand, called frac, is found only in older deposits in certain areas, including central Wisconsin. It's used in hydraulic fracturing, or breaking apart rock using sand and water to pump out oil and natural gas. Several companies have popped up in the area recently because of increased interest from the oil industry, Completion Industrial Minerals President Tom Giordani said. "There are shortages in the market for the sand -- that's why everyone's looking in Wisconsin," he said. Completion, formerly TexSand, had some funding delay its business plan during the recession, but now is back on track to begin excavation this summer, Giordani said. The company is in the process of grading its 57-acre site on 29th Street in Marshfield's Yellowstone Industrial Park and setting up the excavating equipment, including crushers, screens, dryers and belt conveyors. There will be some small control buildings and two 100-foot storage silos on the site, with an office building constructed later, Giordani said. Some sand excavation is expected to begin in August and the system will be fully operational by September or October, he said. There is enough sand in the Marshfield area pits Completion is using to last at least 25 years, he said. But it's been a contentious issue in some states that have fracking operations. Critics argue that chemicals used in fracking may be contaminating water supplies. And it's the subject of a documentary titled Gasland. A coalition of southeastern Wisconsin civic, educational and business leaders is asking the state Legislature to restore state funding for mass transit in the region. The coalition sent a letter to state senators and Assembly members Monday, calling on legislators to refrain from making the cuts outlined in Gov. Scott Walker’s budget repair bill. The letter said mass transit is vital to the economic future of southeastern Wisconsin economy. The letter was co-signed by Kenosha Mayor Keith Bosman; Cudahy Mayor Anthony Day; St. Francis Mayor Al Richards; South Milwaukee Mayor Tom Zepecki; Racine Mayor John Dickert; Oak Creek Mayor Richard Bolander; Milwaukee County Executive Chris Abele; Greater Milwaukee Committee President Julia Taylor; Racine Area Chamber of Commerce President Michael Kobylka; South Suburban Chamber of Commerce President Barbara Wesener; KenoshaArea Business Alliance President Todd Battle; University of Wisconsin-Milwaukee Chancellor Michael Lovell; University of Wisconsin-Parkside Chancellor Deborah Ford; Milwaukee Downtown Executive Director Beth Nicols; Devin Sutherland of Downtown Racine Corp. BID #1; Mike Fabishak of Associated General Contractors Greater Milwaukee; and Tom Rave of The Gateway to Milwaukee. “In the current economy, creating, maintaining, and connecting people to private sector jobs is a top priority. The state budget proposal to drastically reduce state funding for already severely strained transit systems in SE Wisconsin would threaten economic growth by making it harder or impossible for workers to get to jobs and discourage employers from locating or expanding in Wisconsin. . . .
Watch and learn about this year's keynote speakers: Will Allen, founder and CEO of Growing Power; Chris Paine, writer and director of Who Killed the Electric Car? ; and a panel from the Central Wisconsin Resiliency Project. Enjoy lively entertainment provided by Baba Ganooj, VO5, Banned Wagon and other stellar talent. Don’t forget about the great food and local beer! See who comes to the Fair, why they come, and what you can expect by attending. Enjoy viewing this video and share it with your friends! Green jobs represent some of the nation’s fastest growing industries with no reason to believe they will slow down anytime soon, according to a recent report released by Ibisworld. The report, “Top ten fastest growing industries,” lists the fastest growing sectors in the United States by percentage of revenue and includes wind power (#3), environmental consulting (#7) and solar power (#10). These industries are growing fast and will likely continue to grow for years: the solar industry can expect to grow another 7.9 percent by 2016, and wind can expect to grow 11.2 percent, according to the report. Green jobs represent a bright spot in today’s troubled economic times. With forecasts of solid growth on the horizon, it would only make sense to invest in clean energy and harness its job-creating potential. Unfortunately, we seem to be moving in the opposite direction as a state. Early this year, the legislature made it more difficult to construct safe wind farms in Wisconsin, killing proposed wind projects and hundreds of jobs they were set to create. In May, the Joint Finance Committee voted to cut funding for Focus on Energy, our statewide energy efficiency and renewable energy program. Unless undone by the legislature as a whole, or vetoed by Gov. Walker, this move promises to result in higher energy bills and lost jobs. Dairyland Power will begin removing spent fuel from its Genoa, Wis., nuclear plant and encasing it in steel and concrete casks later this spring, nearly a quarter century after the plant ceased operations. Though the federal government has no immediate plans to take possession of the radioactive waste, the move to store it temporarily on site should cut by two-thirds the power cooperative's cost to staff the plant and speed up the decommissioning process, expected to take another seven years and bring decommissioning costs to an estimated $79 million. It's a scenario that Dairyland's founders couldn't have envisioned in 1941, when they banded together to create a network to provide reliable electric power to rural Wisconsin. But those founders were thinking about the future, said Dairyland president William Berg, who encouraged some 700 delegates of Dairyland's members to continue building value during his address at the cooperative's 70th annual meeting Wednesday. That means building a system with the capacity to meet future needs while preserving the environment and embracing renewable energy sources when the future of coal - the basis for most of today's power - is in question. Dairyland now generates about 11 percent of its electricity with renewables such as wind, hydro and biomass-fueled generators. Berg said the company is on track to meet its goal of 25 percent by 2025. 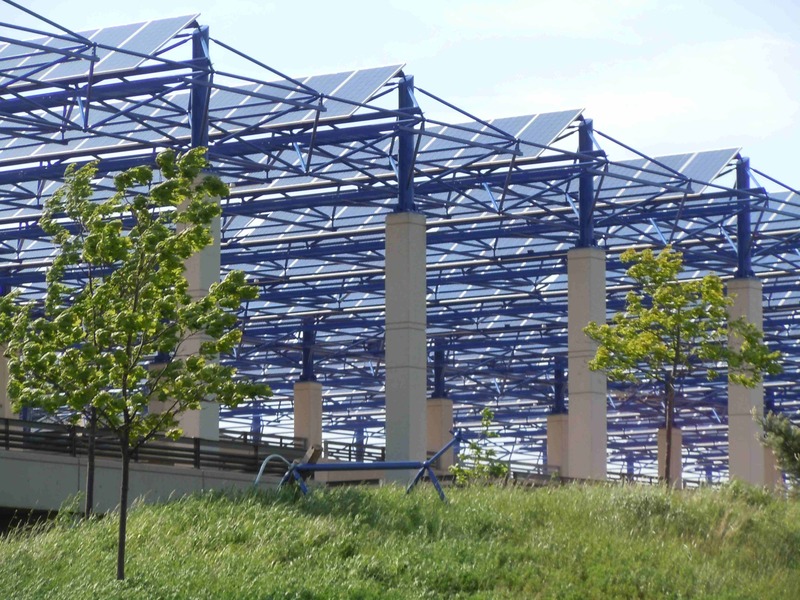 1,300 solar panels rise above a parking lost at Epic Systems in Verona, WI. Verona - By the end of the year, the largest solar project yet built in Wisconsin will take shape in the rolling countryside that Epic Systems calls home. It is “the most gorgeous landfill in the state of Wisconsin,” La Crosse County Solid Waste Director Hank Koch says. He could be considered a bit biased. But state Department of Natural Resources Secretary Cathy Stepp didn’t disagree after seeing the site Wednesday. “I never imagined I could be so impressed with a landfill operation,” Stepp later said. With wind ruffling the tall grass on the surrounding hillsides, Stepp on Wednesday recognized the 300-acre complex as the first publicly owned landfill admitted to the state’s Green Tier program. The ceremony also included a groundbreaking on the estimated $4 million gas-to-energy partnership that will pipe landfill methane about 1.6 miles to provide virtually all the heat and electrical needs at Gundersen Lutheran’s Onalaska clinic. Contractor McHugh Excavating and Plumbing of Onalaska is expected to begin work next week, and the gas could begin flowing as early as October, officials said Wednesday. “The happiest day is going to be when they turn that flare off,” Koch said, referring to the flame now burning off the landfill gas. While the gas-to-energy arrangement isn’t unique, the partnership with a health care system is, said Jeff Rich, Gundersen’s executive director of efficiency improvements. “This is just a win-win-win for everybody,” the entire community included, Rich said. 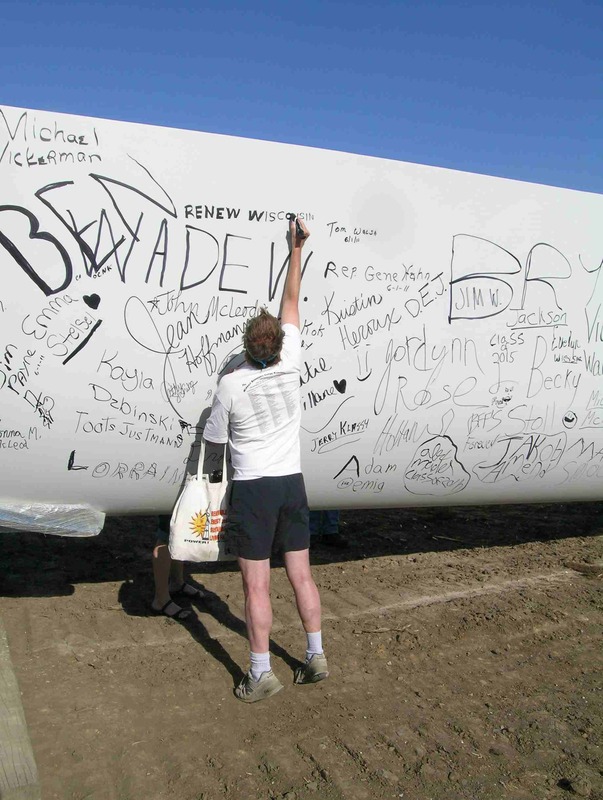 TOWN OF SCOTT - Along with names, dates and shout-outs to favorite sports teams, the writing on the turbine blade included a warning: "Watch out." Mark Barden wrote it, in permanent black marker. The warning, he said, is aimed at any birds that might fly near the blade once it's turning, 400 feet in the air. Wednesday's open house at the Glacier Hills Wind Park was Barden's first up-close look at the components of the 90 electricity-generating wind turbines that have begun to rise in the skyline in northeast Columbia County. But it won't be his last look. Barden said three of the towers will be on his land in the town of Scott, just outside of Cambria. He said he doesn't share the health and safety concerns about the wind towers that many of their opponents cited in seeking to block the construction of Glacier Hills - things such as constant low-level noise and shadow flicker. "I'm more worried," he said, "about the red lights at night," he said. "When I look in the sky and try to find constellations, all I'll see is the red beacons (on the towers). "But," Barden added, "we'll deal with that." Barden was one of several hundred people who attended the open house, which included indoor easel and tabletop displays, and a tour - on foot or by school bus - of one of the four towers that, as of Wednesday, had two of its four segments erected. Mike Strader, site manager for the We Energies project, said that, barring wind or other inclement weather, plans call for adding the top two segments to at least one of the towers today, with the hub, cell and three blades of the turbine to follow soon. More photos on RENEW's Facebook page. About 40,000 homes and businesses from Middleton to north of La Crosse are getting letters this week from American Transmission Co. telling them a powerful electrical transmission line could be built within 3,000 feet — or about half a mile — and inviting them to public meetings later this month. Plans for the so-called Badger Coulee line, introduced in 2010, are moving into phase 2. ATC has taken the broad swath from south-central to western Wisconsin and identified dozens of corridors to consider for the project, which will carry 345 kilovolts of electricity over 150 miles and will cost about $425 million. • In Dane County, the line could run north from the town of Middleton or it could skirt the west edge of Waunakee and go through DeForest’s north side, then head up Highway 12, Interstate 39 or Highway 51. • It could run along the edge of communities such as Prairie du Sac, Lodi, Poynette, Portage, West Baraboo, Elroy or Viroqua. It also could travel through Reedsburg, Wisconsin Dells or Mauston. • Richland County will be spared. The area being studied has been expanded north into Trempealeau and Jackson counties. That’s because the Badger Coulee line might meet up with CapX2020, a 700-mile series of mostly 345-kilovolt lines stretching from the Dakotas. CapX2020 proposes to cross into Wisconsin at Alma, in Buffalo County.